Union Horse Distilling Co. is an artisanal distillery and event venue handcrafting small batch, award-winning sprits in Kansas City. UHDCo. 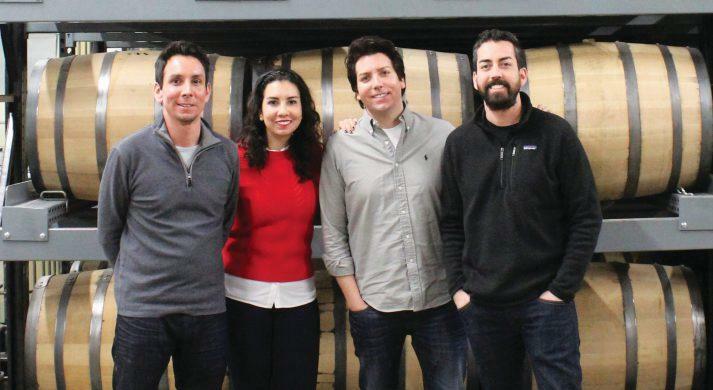 is family-owned and operated by the Garcia's, Damian (Director of Sales & Marketing), Patrick (Master Distiller), Eric (GM) and Mary (Director of Special Events). This grain-to-bottle, craft distillery was known as Dark Horse Distillery until 2016, invoking the long shot odds of running a successful distilling business with the big brands dominating the market. Focusing on craft whiskies, UHDCo. buys its grain from regional farmers and mills it in the distillery, giving them a unique amount of control over the grain bill and the sour mash process they employ in all their whiskeys. And, ever mindful to reduce waste, the distillery hands over its spent mash to a local dairy farmer who uses it as feed for cattle. Both the Rye and Bourbon are gently distilled in a 500-gallon copper hybrid still, affectionately named Chester Copperpot, then matured in new American Missouri Oak barrels for a minimum of 2 years and up to 5 years. At Union Horse, every bottle of Rye and Bourbon is hand-labeled and each bottle is numbered and signed by Patrick Garcia. These whiskies are truly "small batch" as the distillery only makes about 2,500 bottles of whiskey (between their Bourbon and Rye) a month. Union Horse whiskies are not charcoal-filtered and no artificial coloring or flavoring agents are used; everything here is real, even the family horses that are depicted on the two labels, named Chrome and Steel.